Home Sheducation Centre Why Add a Mezzanine Floor to Your Commercial Shed? Why Add a Mezzanine Floor to Your Commercial Shed? When we erect large commercial sheds in the Perth area, we are often asked why we build a mezzanine floor. While there is no “one size fits all” answer because every situation is different, there are some benefits to mezzanine floors that are universal and applicable to nearly every situation. We would like to explain some of the benefits of adding a mezzanine floor to a commercial shed. Mezzanine Floor: What is it? A mezzanine floor is a raised area which is supported by steel columns and acts as a separate structure from the building itself. A small mezzanine floor can measure as little as 2m X 2m or it can be almost as large as the structure in which it is contained. They can be as tall as necessary, though we do recommend at least a clearance of 2.4 m to the underside of the building. The main benefit to a mezzanine floor is that they add space to any structure. They can almost double the office space within a large commercial building. This promotes highly cost-efficient use of space and can be used as either storage or office space. Mezzanine floors offer the ultimate in flexibility. You can basically build one in any shape or size in any location of your commercial shed. They not only add a second layer of space, but they can also be used as walls to separate areas on the lower level. Many satisfied customers call us back to provide mezzanine floors as an upgrade to provide more space. A mezzanine floor can be seamlessly integrated within your current space, with minimal disruption to your current operation. 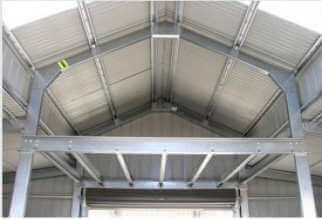 They are also easily added to initial erection of your commercial shed. Mezzanine floors are also great additions to barns, farm sheds, Durastall stables and machinery sheds. Many satisfied Perth and WA customers have used mezzanine floors to increase the space in their farm buildings and we have received nothing but positive feedback. At Action Sheds Australia, no commercial shed is too big or too small. We are experts at providing the most cost-efficient solution for your commercial building needs. Call 1300 778 628 today.